Implementing the decisions of popular votes held in the United States in Colorado and Washington to allow for the recreational use of cannabis would be a violation of international laws, the United Nations body tasked with monitoring the production and consumption of narcotics worldwide said today. The move “would be a violation of international law, namely the United Nations Single Convention on Narcotic Drugs of 1961, to which the United States is party,” the President of the International Narcotics Control Board (INCB), Raymond Yans, told the 56th session of the Commission on Narcotic Drugs. In November 2012, the electorate in Colorado and Washington voted to legalize recreational marijuana use in their states. Medical marijuana businesses operate in Colorado, Washington and 16 other states, but the US Government continues to oppose any decriminalization of the drug. The Office of the US Attorney General said in December 2012 that regardless of any changes in state law, growing, selling or possessing any amount of marijuana remained illegal under federal law. Mr. Yans called the statement “good but insufficient” and said he hoped that the issue would soon be addressed by the US Government in line with the international drug control treaties. 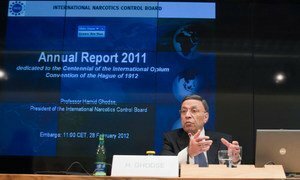 Based in Vienna, the INCB is an independent and quasi-judicial monitoring body mandated to implement UN international drug control conventions. Helping marginalized communities and young people experiencing drug problems must be an international priority, the United Nations body tasked with monitoring the production and consumption of narcotics worldwide said today, urging countries to protect these groups so they can be reintegrated into society.